Breathtaking design meets unrivaled craftsmanship in the KOHLER Tailored vanity collection. No detail was overlooked in the meticulous crafting of this collection, from the premium hardwoods to the specially designed hardware and vanity tops, all available in an array of finishes to create your own look. This Jacquard vanity echoes the designs found in traditional furniture and cabinetry making techniques, pared down to the absolutely essential. Complete your vanity with a coordinating top, hardware, and accessories from the collection. Enveloped in an Antique Walnut finish and accented with black birdcage-style hardware. This fully-assembled, 36 inch vanity features a unique design. 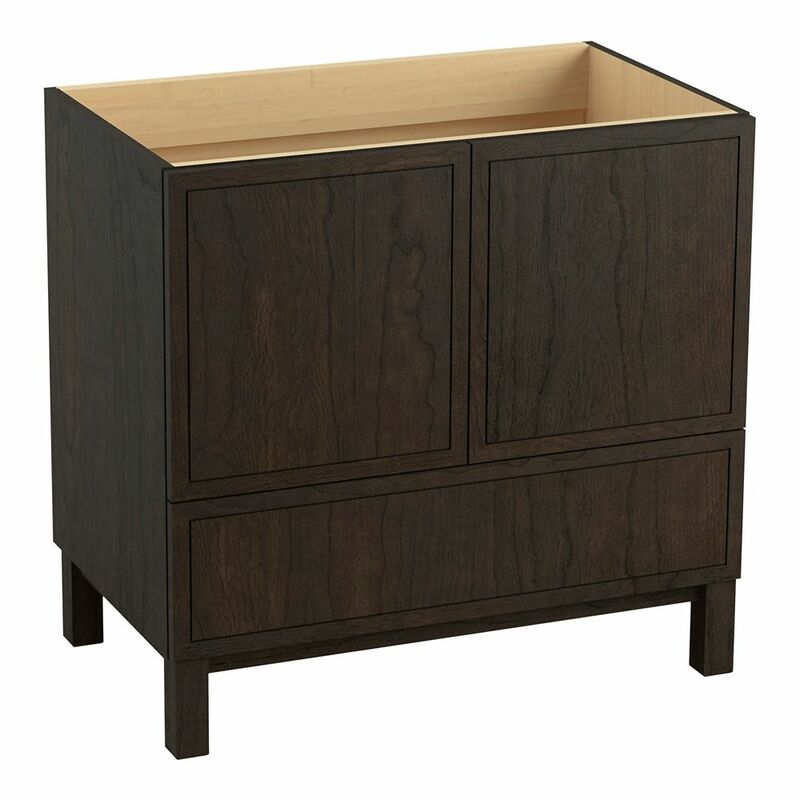 Its 3 full-extension drawers are on the left side, providing ample storage space. Behind its 2 beautiful doors on the right lies an even larger storage area that's perfect for stacks of towels and a wide array of bath, skincare and household items. Crafted only with durable woods and designed to accommodate a single centerset basinch (Not included). Add the warmth and elegance of natural wood to your bathroom, with the Naples 36 inch Vanity and 37 inch Carrara White natural stone vanity top with pre-attached oval under-mount vitreous china bowl. Treated with an Antique Walnut finish, this furniture-style vanity cabinet features 2 doors and 3 drawers that offer ample storage space. The cabinet's full-extension drawer glides provide smooth opening and closing and its maple interior is coated with PVC for easy cleaning. The cabinet features black birdcage-style door handles for a decorative touch. Jacquard 36 inch Vanity With Furniture Legs, 2 Doors And 1 Drawer, Felt Grey Breathtaking design meets unrivaled craftsmanship in the KOHLER Tailored vanity collection. No detail was overlooked in the meticulous crafting of this collection, from the premium hardwoods to the specially designed hardware and vanity tops, all available in an array of finishes to create your own look. This Jacquard vanity echoes the designs found in traditional furniture and cabinetry making techniques, pared down to the absolutely essential. Complete your vanity with a coordinating top, hardware, and accessories from the collection.